Love the website!! The history of the Addams family home is awesome. Keep up the good work. It’s a shame that the house was demolished. Interesting read on the history of the house as well. Not sure if I have the time to contribute on a long-term basis, but I can tell you that my grandparents were residents of 21 Chester Place for many years (1930’s – 1960’s). And that my parent’s wedding reception was held in that house. About the Addams Family, the story goes that only a picture of the house was used (and altered) for the show. My grandparents were living in the house when we were watching the show during the ’60’s. The house was built in the 1860’s and torn down in 1968. Also, Chester Place, and that same house, was used in the movie “Seven Days in May”. We spent many days and nights there. It was a great house. Thanks for leaving a comment – that is so cool that you have been in that house, I am so jealous! It truly is a shame that the house is gone now, wish it had been saved somehow. Although, I don’t think the house was built in the 1860’s because Walter Scott Newhall supposedly built the home (or had it built). He was born in 1860, so I still speculate that the house was built in his late 20’s or early 30’s. At this point I think that the house was built some time between 1888-1890ish (? ), but until I find out for certain, it is only speculation – Truthfully, I am not completely sure yet because I have yet to find something solid. By the way, when I was researching the house I came across a forum where someone wrote that the grandson of the grandparents that rented the home for years, had posted about his grandparents living there and that he had been in that house etc.. So I have heard of you before and I appreciate you posting here. I will also check out “Seven Days in May” as well, thank you! Enjoyable history of the Newhall house. Thanks for the response Helen. It’s nice to know that there are others that are also interested in this stuff too! I will go check out the blog you recommended, seems to be right up my alley. Thanks again for the interest! Dear Mr. Myers: First of all, we want to say how impressed we are with your history of #21 Chester Place. It is the sort of project that is dear to our hearts. A facebook fan of ours, Miss Helen Murgatroyd, brought your endeavor to our attention. One thing you might be interested in that we do not believe you covered in your history is that, according to several issues of the Southwest Blue Book of the 1920s, a family named Adams (alas, one “d”) actually did live at #21 Chester Place. The widow Mrs. James H. Adams (nee Lillian Turner) was apparently renting #21 from the Dohenys, living there with her son Morgan. They were very well placed socially in the Los Angeles of the time; among her club affiliations were the Ebell, the Crags Country Club out in Calabasas, the Los Angeles Country Club, as well a widow’s membership in the California Club. Mr. Adams was most likely a business cohort of Edward Doheny; the Dohenys were by all accounts madly obsessed with controlling their environment, prime evidence of which is their acquisition of as much of Chester Place as they could manage–and more, as evidenced by their purchase of the 25th Street houses. Their properties on the expanded Chester Place were no mere multifamily “rent houses,” but rather exclusive single-family homes offered as almost grace-and-favor housing to those in the Doheny circle. (The rental terms offered were in many cases extremely generous.) Some people, for reasons best known to them, were willing to subject themselves to the Dohenys’ strict landlordship; many other well-connected Angelenos, of course, valued their autonomy and built or bought elsewhere, such as next door in St. James Park as well as in Berkeley Square and elsewhere in West Adams, or, increasingly, to the north in Los Feliz, Windsor Square, and Hancock Park, and to the west–Beverly Hills, Bel-Air, Brentwood, etc. I really appreciate that, thank you. I’m at work at the moment, but tonight when I get home I will look at your blogs properly. I just quickly took a look and am very interested in reading all of it and can already see some changes that I would like to make here, in regards to yours. Look forward to speaking with you soon! James– Thanks for your comment on my St. James Park blog–I’m glad it has provided some inspiration! (Full disclosure–I’m “GaylordWilshire” of “Noirish” notoriety.) Please feel free to use the L.A. Herald ad–you should probably credit it as I have. (Sometimes uncredited photos on these blogs have been known to disappear; some sources are touchier than others.) Btw, I put your blog on my lists of “Worthwhile Links” on my two blogs. Also, I know a number of the bloggers who do various L.A. architectural/historical blogs, and we often make suggestions to one another, or advise corrections. I’m answering here since I don’t have your email–if you want to communicate more directly, email me at berkeleysquarelosangeles@gmail.com. Oh ok, wow it is a small world! Here I was thinking “if he ends up letting me use the ad I am going to put him in my introduction and thank him”. But now I see that I already have! Thanks for letting me use the pic and for writing to me in general. Let me know if there is anything I can do for you…. PS Just so you know, the border colors on the SJP ad were added by me–not original to the ad, of course. I can direct you to a more direct source if you like. Hi Guido, thanks for leaving a comment. I also wish that there were more pictures of 21 Chester Place (I am always searching for more)! I bet that there are more out there, if I find them I will certainly post them. Thanks again for the interest and your nice message, I appreciate that. Very interesting. It’s obvious that you’ve done considerable research and that every minute was a labor of love. The 21 Chester Place house as depicted on the Addams Family frightfully funny sit-com is every much an icon as is the Bates’ house on the hill behind the motel. Take care. hope to see you the next time we’re in east Texas. Labor of love – good way of putting it. It was so much fun making this site, I learned a lot about the house. Thanks Woody for stopping by and leaving a message in the mailbox! I want to congratulate you on a job well done! This is an invaluable resource and a goldmine of information to fans of the Addams Family Manse from the classic show. I am a lover and scholar of Second Empire Architecture in general as well as the more “iconic” examples of the breed that appear in pop culture, such as the Addams Family Mansions (plural), the Munster Home and the Bates Mansion from Psycho, just to name a few. It seems that for decades, whenever Hollywood chose to portray a “spooky” or “sinister” old house, Second Empire more often than not was the chosen style. In the spirit of accuracy, I would like to point out that the REAL Chester Place residence was not, in fact, a Second Empire style home. All the elements that transformed it into that style (such as the Mansard roof and tower) were only added via the Matte Painting effect used by the TV show. That is not to say that the Chester Place house wasn’t a beautiful or interesting home; (one only needs to look at the photographs to see that it was). Chester Place is, however, a sort of architectural “oddball”. The massing of the house, as well as the rectangular paired windows and third floor dormers indicate a nod to early “Colonial Revival”, while the irregular roof and details like the wooden spindlework around the port cochere suggest “Queen Anne”. This meshing of multiple styles was typical of the period and would historically support your theory that the house was built between 1885-1895, a time period in which both styles were in use. If I were to classify it, I would call the house Queen Anne style with a Colonial influence, and not Second Empire as you have suggested. Please do not think I am being nitpicky… I merely felt it was my obligation to point out the discrepancy. I commend you again for your fine work. If not for you, the story of 21 Chester Place would have faded into historical obscurity and been lost to history. Thank you, thank you, thank you for your effort. I am not upset at all, in fact I am thrilled that you found me. I can not thank you enough for the interest and the correction. I agree with your opinion in it being an architectural “oddball”. It definitely was one of a kind and have never seen anything quite like it since. It still hurts to think it is gone now, that such a beautiful and “famous” home like 21 Chester Place was ever thrown to the way side; to replace it with a track and field for a high school is just unthinkable. I believe the idea of Second Empire architecture being used to signify spooky came right from Charles Addams’s cartoons in The New Yorker…and I’ve read that his Addams Family house was modeled on an actual house with a mansard roof he knew of in his New Jersey hometown. That’s very true. The Addams Family cartoons played a major role in germinating the idea of the spooky old Second Empire “Haunted House” in America’s subconscious. I have also read that Addams’ hometown of Westfield, NJ, like many other small towns throughout NY, NJ, Ohio and Pennsylvania, boasts several examples of homes in the Second Empire style, although it’s difficult to pinpoint one specific house as Addams’ inspiration. It might be fairer to say Addams was exposed to the style his entire life, perhaps even an admirer of it, and based his Addams Family Mansion upon memories of houses he had seen growing up. One other factor to consider: to modern sensibilities, the style seems florid, overwrought and old-fashioned, but in its heyday it was considered avante garde and even “modern”. It was the perfect architectural style for the newly wealthy who wanted to express their newfound fortune. It seems though that the style fell out of favor just as quickly and by the 1930’s and 1940’s, Americans had abandoned these homes by the hundreds. In towns across the continent there existed examples of decrepit Second Empire homes, empty and abandoned because their owners were unwilling or financially unable to keep up their “fussy, gloomy old Mansards”. They were torn down in droves. A case in point, the Old Granville House in Frank Capra’s “It’s a Wonderful Life.” It would seem that by 1940, almost every town in America had an “Old Granville House” of their own, and this is probably where the real root of the idea took hold. So while Charles Addams didn’t necessarily plant the seed of the archetype “spooky old house”, he was certainly the gardener who watered it, tended it and brought the idea to fruition. Excellent work on this house–it’s very difficult to find all this info about just one house! I was intrigued by the house’s age–and I’m interested in Chester Place and St. James Park. I looked for an early entry for Newhall in the 1880’s Los Angeles Directories to help confirm when the house was built. I found that in 1888 Henry G. Newhall, an older brother of Walter, was in the house while Walter lived in San Francisco. I put up an image of the page so you can see it too. hhmmm, now that is interesting. Gonna have to absorb this info and do a little speculating and looking around myself. Although this info is brief, I feel that it is relevant to what was going on then in regards to the brothers and the house. One part of the puzzle that is also missing is why the 2.25 acre land that the house sat on is stated (on maps), as J.H. Newhall. But Walter S. Newhall is the one who is listed as the original owner of the Newhall house. So I think that the land was purchased before by a great grandparent and Walter eventually used that land to have a home built. I know from reading certain things (like this info) that he frequented San Francisco for business and was eventually buried there with the Newhall Family. Now I see that the family did have their office building in San Francisco and seems he lived there at times, and lived in Los Angeles at times (obviously lending the house out to family whenever needed). Very interesting. Anybody got a time machine I can borrow? 🙂 Love this kind of stuff, keep it coming! Just wanted to let you know that I was able to use the info you provided to help figure out the date of construction! The info you provided, coupled with some other articles, confirmed who originally built and owned the house. I can not thank you enough – Added you to my “Thanks” list in the introduction. James — “The J.H. Newhall” on the Baist maps confused me too. I hesitate to state anything emphatically, as sorting out all the California Newhalls would be quite a job. But perhaps J.H. was the brother of Henry Mayo Newhall (b 1825), father five sons by two wives who were sisters, including H. G. (b 1853), Walter (b 1862), and George Almer Newhall (b 1862). The family holdings were vast, with many of its members involved. I’ve read of a nephew of H.M.’s named Joshua O. Newhall–could his father have been “J.H.”? There is also sometimes the problem of mislabeled documents. This stuff is like handling mercury…. As soon as I posted the above, I read of Henry’s brother Joshua O. Newhall–b. 1827–obviously the nephew’s father. In all the things I’ve seen on the family, I haven’t seen a reference to a “J.H.”–so, again, maybe the the Baist map is in error… either it was meant to be “J.O.”–or some other Newhall altogether. I know, it is a mystery to me as well at the moment. There are so many J’s in the male family line too before Walter (makes it even harder), and the Newhall Family Genealogy page that I am referencing unfortunately does not list a middle initial for these relatives. Could the J.H. possibly be a combination of Walter’s grandpa and dads first initials combined (Jonathan and Henry)? Or Walter’s grandpa and grandmas first initials (which were J and H cause her name was Hannah)? May never know, but I am always searching for more info. I am sure some of you can relate, the countless hours I spend just daydreaming and speculating about this house and the past/history that surround it…and then to finally find facts and part of the puzzle comes together, Love it! I am here everyday behind the scenes fixing mistakes or rewording things, basically nitpicking the site to my perceived perfection 🙂 I can’t thank you all enough for your interest and input. Thank you! I am very glad to see that someone has finally posted a site with this information. I was a fan of the show when it was first being broadcast. After seeing the first episode and getting the trading cards I wondered where the “real” house might be. Through later years this was one of my most favored film location quests, especially since it went unresolved for me for so long. Several years ago I got one final giant bee in my bonnet (Sorry, that morphed ancient expression is even much older than I am, in case you have never heard it.) and spent more time online trying to connect any new dots that I might find. That didn’t go very well but Google Earth helped me to view some new possibilities. Then I found the connecting clue that helped me focus on one possible location. On a trip where I was exploring other filming locations, I visited the campus and was finally satisfied that that was where the house had been. Info and pics that came online afterwards helped me to confirm this for myself and now I am very happy to find this site and I look forward to learning more about the history of 21 Chester Place, The Addams Family Production and any other projects that filmed there. Do you know of anyone interested in recreating the Addams Family Mansion? James, this is a great site. I’m working on a blog post about the Addam’s Family. Do you have an email address I can contact you at? Hallo everyone ! I have an image found on internet of a picture ( not really a photo ) paintted by one of the neighbour Sisters . Could you give me an email address so I can share it with you !? It’s an interesting front view of this wonderful house ! Here is the photo that Guido is speaking of – Copyright goes to “Mount St. Mary’s College”, for Sister Ignatia who drew this painting. Thanks Guido for the nice comments – I appreciate that. Back in 1991 People Magazine ran a short retrospective “Where Are They Now” article about the Addams Family cast. here was a full page photo of the cast in the TV car in front of the huge painting of the mansion. You can see the bottom of the painting too where it meets the studio floor. Great pic, thank you for sharing that trevor22a – Wish they hadn’t drew the tower leaning a little to the left though. But other than that it’s an interesting picture. Just discovered this site. Many, MANY thanks for answering some of the questions I have had about this house since I first saw the tv show in 1964. Great job. I, too, would love to build it. Thanks again! Clearly, 21 Chester Place is the Addams house, I was wondering if the inspiration for the “spooky mansion” facade might have an SU connection, or if this is an urban myth. No …that’s an urban legend, like many others ( many towns claim to have an old victorian house which inspired the addams family house…. ). 21 Chester Place was an actual private residence which was partially used for the television series only. The series production asked and payd for the permission of filming some scenes in front of this old house in Los Angeles. It had to resemble the gloomy house previously seen on the Addams Family cartoons appeared on on the New Yorker Magazine, so they took some photos of it and added – in studio – some features like a gloomy tower, etc ( read carefully this site for further info ). Charles Addams – author of the original cartoons – was very fascinated by old victorian buildings in his childhood and also took inspiration from some artwork of artist Edward Hopper for his Addams family stories and house also. But that’s all. Anyway, most of victorian houses are usually quite similar and have a tower, heavily-carved wooden-artwork, porches and iron fences, etc but not all the victorian houses are the Addams Family House ! Curiously enough this “vaudville” house on 21 Chester Place in Los Angeles was not so “victorian” as it appeared on screen, even if it dates 1890 circa. There are many “Queen Anne” elements ( like the large porch on the front : remember the cottage on “Fantasy Island” ? It still is at the L.A. Arboretum ) but it has some unusual details and many “modern” aspects which make it a sort of mix of different styles. The author of this site explains this carefully in some of the internal chapters : give a look if you are interested in the thing ! Cheers, Guido. Also, a couple of times, the supposed rear of the house was shown on ‘The Addams Family’. It appears, though that they simply used a reverse version of the matte painting, and it was at night. Can’t give you the episode number but it was ‘The Addams Family And The Spaceman.’ And I believe that they showed a different angle in one of the two episodes about how Gomez and Morticia met. Thanks again, and keep up the good work! Thanks Stuart for the nice words and for taking the time to leave a comment. I also have spent many hours drawing the house and my own version of the floor plans. I even have the last set that I drew a few years back, framed and hung in the guest room at my house. 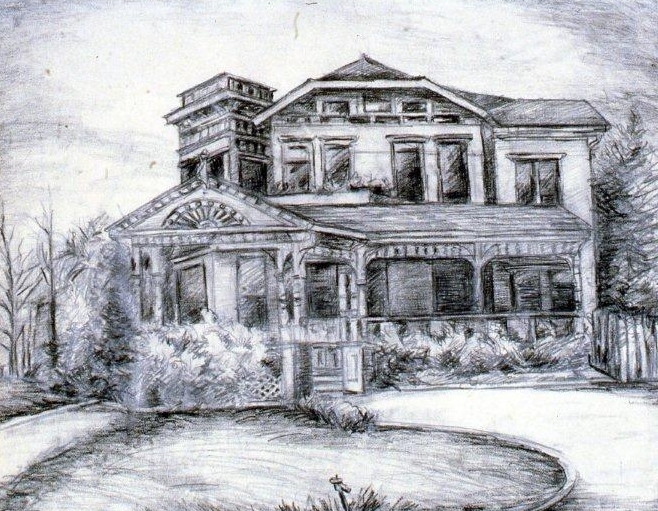 I didnt know that they had shown the Newhall house briefly on the show “Hazel”. I never watched that sitcom but now that you have stated that, I might just try and locate which episode it was shown in (although it might be difficult). That is very interesting. Thanks again for leaving a message and the nice comments, I appreciate that. 21chesterplace! I have always had an affinity for the Addams family over the Munsters, as the debate goes. And I didn’t really enjoy the remake movies. But this summer, I have been able to watch lots of Addams Family as it began to air again, and my young sons have been watching it too. What a great time! Your website has been a wonderful study and I have had a great time reading it, even though I am a bit bummed out that we can’t visit it. We went to see the Laurel and Hardy Steps last summer, have seen Seinfeld’s apartment building, and hope to see the Brady Bunch house this summer. Alas, the Addams’ place won’t be on our list. THANK YOU, THANK YOU, THANK YOU for your diligent work! It is a shame that the house is gone – I also still love watching “The Addams Family” TV show (even though I have seen every episode countless times), but still find myself glued to the TV when they show reruns especially during the month of October when Halloween is approaching. For me it is just one of those shows that I can watch over and over. Thank you for the nice comments, glad you found us here! Hello! I’m a writer working for Yahoo and we’re doing a story on the Addams Family mansion and the homes that inspired it for the 50th anniversary. Maybe we can chat about your research? I hadn’t noticed your comment before now, but I just wanted to let you know that Gomez (John Astin) and Wednesday (Lisa Loring) are still with us! Sadly, the rest of the cast has passed on. I’m another obsessive fan of the house that only appeared on-air for a few minutes, 50 years ago! Thank you James (and your other contributors), for all of the diligent work you’ve put into this project. I’ve learned a few new and valuable things about the house here! As with yourself, re-creating and living in this house has been a lifelong ambition for me from the time I first watched the show in 1964. I was dismayed when I found out how many of the most iconic props had been destroyed by fire: the painting of Gomez’s giraffe friend, the two-headed turtle, Cousin Farouk! Here’s a fact that I don’t recall reading on your site: the Addams Family living room set was either re-used or rebuilt from pieces of the set from The Unsinkable Molly Brown, starring Debbie Reynolds, released earlier in 1964. It’s worth a watch. I, too, have spent countless hours trying to recreate the floor plan, the most difficult parts of course being to reconcile the interior sets with the exterior features of the real house/matte painting. The photo used for the People Magazine article shows FAR more detail than any other image I’ve seen of the matte, including the coach house we know stood there. This would suggest that there are or were other very detailed photos of the house, or that the original matte was more inclusive than what was actually used for the show. Several years ago I came up with a solution to the entryways that—while it doesn’t follow the continuity intended by the editors, does adhere to the interior-exterior visual canon of the show, while still being practical. It solves the problem of the real exterior tower and porte cochere not resembling the porch and foyer from the film set. In fact, the two areas are so differently constructed that it’s clearly impossible for them to be the same space. So, logic dictates that they must be different entrances! In the pilot, Mr. Hilliard entered the premises through the gate, approaching the port cocher. For whatever reason, he continued on counterclockwise around the right side of the house where he finds the small porch, entry, and foyer so often filmed subsequently. I’d love to compare notes sometime if you like. Thank you for your comment – I apologize for not replying to this sooner, but have had other issues going on /work/family/etc…that have caused my delay – I appreciate your comment and as you know, I also love this house! I assume that since the show was filmed on a set instead of the actual house (unfortunately), that in the studio they did what they could to portray the exterior front porch in a way that would suite the filming of the show; They obviously did not try and recreate the Porte-cochère in the studio, which is where the front door was actually located at for 21 Chester Place. never really been topped, IMHO. Please accept my thanks for preserving all this on your find web page. You have done a fine job and it is much appreciated! Thank you Andrew, it truly is my pleasure. I always noticed that the opening credits house seemed cartoonish although I remember the pilot with a real house. Thanks for making this all happen. I have always loved that house and have looked for it in LA. No backlots ever mentioned it as a facade so I assumed it must have been real. A great 1st & 2nd floor but not as tall and elegant as needed. Dear Mr. Myers, that is a super article on 21 Chester place, my grandparents were Paul and Helen Grafe, my mother, Louise the middle daughter and her 2 sisters grew up there and went to school at Marymount until my grandfather bought the Ferndale Ranch \ from Mrs. Doheney in 1944, my grandparents would go back and forth from LA to Santa Paula. I also was many times in “Chester Place” as we called it. It was a fascinating house inside. Beautifully decorated, enchanting rooms, we all loved to go into the city and stay. When my grandfather saw the Adamms Family house on TV, he called the studio and said “you put our house on without our permission!!! !” They said “oh sorry what would you like?” My grandfather was happy with a new Olympus camera that had just come out. The family has super memories of Chester place, so sad it was torn down to make a parking lot, exactly like the song!! Many thanks for the history. I am elated to receive your message. Thank you for taking the time to write and share some of your personal family memories of 21 Chester Place. I hope you do not mind me saying though in regards to “what is in the place of the house now”, is not a parking lot, but a Track and Field for the Frank D. Lanterman High School. I have aerial photos that show where the house originally sat, and that spot is the schools Track and Field. Never the less, the house is sadly gone and we are only left with a handful of pictures, stories, and just a few clips of video footage of the house. I had someone leave a message here in the “Mailbox” back in 2011 (the 4th message from the top), that might be one of your family members Cate. He or she (they never specified), posted a message as the username ‘gilroytg’ claimed that his/her grandparents were Paul and Helen Grafe. He also said that his/her parents wedding ceremony was held in the house and that they spent many days and nights there at the house. Could this be one of your siblings or cousins? When I started my research on your grandparents I assumed that I would find quite a bit on them (since they lived there the most recent and during the times the house was used for the entertainment business), but unfortunately the days of including the residence of the person in question as social status, had gone to the wayside by then. I have found articles and such on your grandfather (almost always work related), but like I said, there is no longer a mention of any home address within the article. Even with multiple articles, etc….I did not feel like I could create a story-line with them and the house, without speculating too much, so that is why there is not as much about them in the “House History” (unfortunately). It has been over 40 years since I drove by “21” it was a parking lot for the college at least for a few years, so nice to hear that it is being useful now, doing its karma!!! Just checked that email and that is my cousin, he is right his mother and dad were married at St Vincent’s and the reception was held at the house. Mrs. Doheney was my grandmother’s best friend, they were very close and my grandparents became devout Catholics because of her. She was the godmother of my mother and I think my Aunt Paula who was married at St Vincent. Both my parents have passed away and I was the one who cleaned the house out. My aunt Helen just passed away in November and my cousins just cleared her house. My Aunt Paula is still alive, she may have pictures. I am in Switzerland until October then I will return to California, I live 6 months there and 6 months here in Basel. My sister may have pictures. I meet with my cousins and Aunt every month at least with Skype sometimes in person, I may be able to round up some pictures for you but it may be closer to the end of the year when I get back. I have a painting of the house done by Douglas Shively, my grandfather’s friend, a famous artist/banker from Ventura County, along with the ranch house which was built by Wallace Neff in 1929 for the Doheney’s. Lovely pictures that bring back memories.. I will look into the pictures James and have all my family start to look, I can then scan them when I get back and email the to you, I know there are wedding pictures from my aunt at least on the outside of the house, not too sure about the interior but we check it out. So good to be in contact, I do the best I can to come up with something, if you need information on the house my aunt is pretty good at remembering, better that me and I am 64 and she is 86!!! never have thought a childhood nostalgia could yield such a rich reward fifty+ years later. Thank you again for your interest in 21CP and the nice message! I am stunned, truly speechless on how to even reply to your message. Even though we are an ocean apart, it is almost as if we are discussing this over the phone or in person. I never in all of my “speculating and assuming” days, going over and over possibility’s regarding the house and it’s history, did I think that the spot had been briefly used as a temporary parking lot for the campus in the beginning (wow)! Looking at an aerial photo I have of 1972, it does look like the campus by that time had designated another area for parking (unfortunately, there is not an aerial photo for every year, so I can only confirm that they were not using it as a parking lot anymore by 1972). I will definitely update the “House History” to reflect this new info, as well as your family’s purchase of the “Ferndale Ranch” in 1944. I am so excited because I had been having this feeling that the wave of new house info that started flowing at the end of last year and continued (on and off), throughout the beginning of this year, was sadly coming to a halt (and of course there is always that feeling that there is no guarantee that anything new will ever surface again)…..and then I wake up yesterday morning and see your message! Cate, I would be so excited, happy and grateful for any family pictures you happen to come across and choose to share of 21 Chester Place. The thought of possibly being able to finally come up with and give the Grafe’s (your family), a more deserving biography, would be so exciting and rewarding! Hi Andrew, love the modern technology!!! People can always be in contact with one touch on the computer. Cate, that is understandable. Even though I am very, very excited 🙂 I am also patient. I will enjoy each day until then knowing that the “House History” is not finished just yet, but a whole new proper chapter is to come for the Grafe’s! This is so exciting!! Thank you for contacting me and sharing, and for the nice comments. I hope you have a wonderful rest of the summer and I look forward to speaking with you again. It has been a long time since we last spoke. I have thought about you a couple of times in the past few years (especially when I have discovered new articles and photos of the house, and wanted to share the joy over the discovery with you), but hadn’t heard from you in a long time. I am glad to hear from you again and know you are ok! I found a whole batch of new photos just a few nights ago while searching for the house, including the one’s you mentioned. I uploaded two of them to the “Photo Gallery” last night (and one of those got added to the “House History”), and will upload the rest, to the “Photo Gallery” tomorrow when I have some time. If you have Facebook, you can now follow 21 Chester Place on Facebook as well! Post scriptum : James there are 2 things that i wanted to remember you ( and keep forgetting to mention ) but could intetesting to check . 1 – the “cartoonish” image of the opening titles ( the backdrop for” the addams family” logo ) could possibly be a Charles Addams artwork…The original painting has existed for sure and without the addams logo on it ( look closely in an image of producer David Levy standing in his office in The addams chronicles book ) and was used in the packaging of THE THING wind up toy money bank sold in the 60’s. Well .. is there any chance to find out that beautiful painting ? Maybe it’s still in the Levys family ? Would be a nice adding to the story !!! 2 – In few episodes the house image that we are used to see with H. Anderson artwork-changes ( the bumper after comercials ) has been replaced with a strange image of the house …a sort of matt painting with a large consevatory window on the front and a car parked in front of the gate….and the porte cochere on the left ! I have that image somewhere…shall i look for it or you know it already ? Any idea why they used it ? I know that the reverse painting was used in at least two episodes, and possibly a third. It appears in “The Addams Family and the Spaceman,” and in one of the two part episodes about how Gomez and Morticia met (not sure which one). It may show up a third time as well. The first time I saw it (at nine years old), I thought to myself, “did I really see that?”, and had to wait nearly forty years, when the series came out on DVD, to see it again. That sure was a long time to wait to see that image again! It is definitely and odd picture, giving the impression that the back looked almost exactly like the front. Maybe they thought it was Addams like 😉 I never noticed until Guido sent me a photograph of the image, that they drew the fence in and a car with what looks like people staring at the house. Very dark photo though, a little hard to see. Wow! $1.98. Can’t post an image but I have a .jpg if you don’t have it already. I checked – it’s yours for $400-800+. Buy it now option. BTW, I’m a little confused on which exactly are the new images being discussed the last few days. Wish there was a numbering/naming system, perhaps? Quite a few images up on Photo Gallery. Just sayin’. Thought I’d give you a shout out and maybe you could answer a question or two. First of all, Happy belated New Years. I had a few trivia type questions. Is it true that the only on-location filming done at 21 Chester Street was for the pilot and for the 1st episode? Or are those the same? Were these 2nd unit location type shots or did the cast participate in shooting actual scenes for the show? I’m excluding promo shots here and shots/scenes reused in later episodes. Also, in these days of Home Renovation, etc. it is not unknown that older craftsman construction like paneling and other ornamentation might be reused in a newer building. Is there any record of whether family or contractors might have salvaged parts of 21 Chester Street for use elsewhere? (Wouldn’t it be great to find an old warehouse full of that somewhere!). And finally, if I haven’t overwhelmed you enough already, is there any record of what happened to the famous props used on the show? I think somebody actually came up with a pair of Judy Garland’s ruby slippers some years back – so who knows what’s possible? I wish I could be of more help, but I do not know what happened to “The Addams Family” TV show props. I read one time that when it was discovered that the show would not be picked up for a third season, that the set props were immediately pilfered through and taken by the crew that worked on the show (set designers, camera operators, stage hands, etc..). I have read before that some items/props have shown up on ebay once in awhile, like place sets or candle holders that were supposedly used on the show, but are difficult to truly verify their authenticity if you don’t know what episode they are shown in (or if they were ever shown on screen at all). Maybe one day some of the more recognizable props will surface, but so far I have not heard of anyone selling any of the more well known props, that we all are so familiar with on the show. Unfortunately, I do not know what happened to the left over house materials either from 21 Chester Place. More than likely they were hauled off to a local landfill (sickening right?!). Thank you very much for getting back. I used to follow the props years ago, and while a number of them are safe in collections, it seems some of the most iconic ones were lost in a studio fire. Sadly, the two-headed tortoise, the marlin head with the leg in its mouth (Cousin Farook), the moose head, and the giraffe-in-a-suit painting by Karl Hubenthal (“that used to be a friend of my Daddy’s”) were all destroyed. The Iron Maiden from the playroom, the giant polar bear from the living room entry, a pirate chest (belonging to Pegleg Addams), an antique huge-wheeled tricycle (ridden by Wednesday), and a few other small pieces are owned by a gentleman and avid collector of props who goes by the name of Backlot Charlie. I believe someone still has the stretching rack from the playroom as well. By the way, there were several pairs of ruby slippers used in the Wizard of Oz (some say 4, some say 5) discovered in 1970, with the “hero” pair (i.e. most finely detailed, used for close-ups) being bought at auction and anonymously donated to the Smithsonian in 1979. Nice addition to the mailbox, thank you! John Astin and son Sean – in the news! Thank you for the post Andrew. I agree, it’s good to see John looking so well! I’ve been searching for a children’s book I saw in the late seventies, it was similar to the “Eye Witness” books. But, it was illustrated drawing of TV sitcom homes, The Addams Family was one, The Brady Bunch was another. When i happened along this site I thought you might be aware of it. Anyone? Vera, it’s not from the 70s, but are you maybe thinking of Mark Bennett’s book of “blueprints”? If the link fails you can cut ‘n paste into your browser. only one copy left.